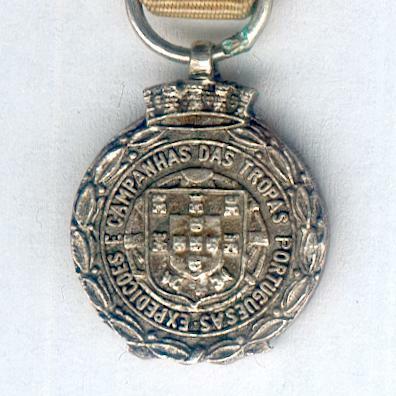 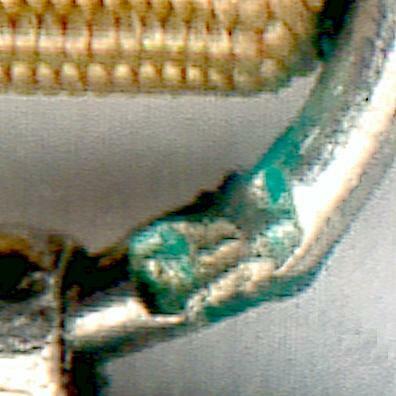 Miniature circular silver medal with loop for ribbon suspension and ring with silver hallmark; the face with the lesser arms of Portugal within a ring inscribed ‘EXPEDICOES E CAMPANHAS DAS TROPAS PORTUGUESAS’ (Expeditions and Campaigns of Portuguese Forces) all within a laurel border, a mural crown above; the reverse with the full-length figures of a soldier, left, an airman, centre, and a sailor, right, the Portuguese flag behind, imposed on a striated medallion inscribed ‘GUINE / CABO VERDE / S. TOME E PRINCIPE/ ANGOLA’ to the left and ‘MOCAMBIQUE / INDIA / MACAU / TIMOR’ to the right, all within a border inscribed ‘ESTE REINO E OBRA DE SOLDADOS’ (This is the Domain and Work of our Soldiers), a mural crown above; diameter 12.54mm (0.49mm); on original post-1946 ribbon. 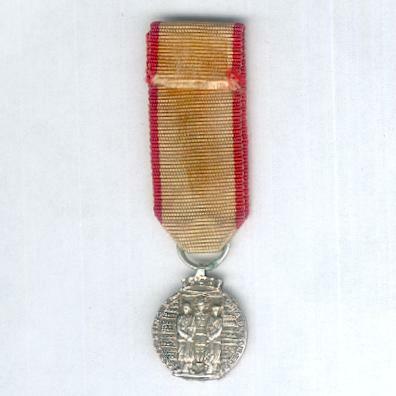 The Medal was instituted on 30 November 1916 by Decree 2870 in conjunction with the War Cross to be awarded for participation in campaigns outside Portugal. 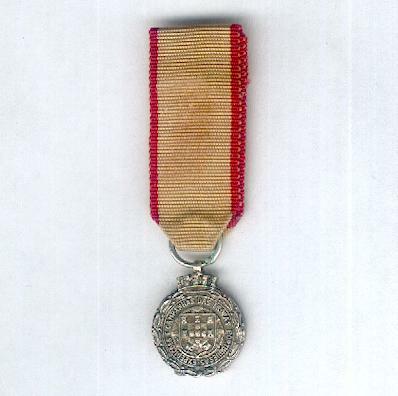 It was replaced in 2002 by the Commemorative Medal for Special Service Commissions of the Portuguese Armed Forces.